In attendance: Chris McGee, Connie Savage, Regina Spiker, Susie Poper, Aliceana Onley, Georgie Dawson, and JZ. Exercise: using post-it note flip-chart paper, each team member wrote down what they hoped to get out of the experience of being on a team to create a one-day staff development conference; they also shared their concerns and what they hope to contribute. Chris: wants to get to know colleagues from other counties; wants to contribute his attention to detail, his ability to get it done!, and his cooperative nature. He's concerned about time constraints but works well if given finite tasks and due dates. Connie: is concerned about tailoring the summit to meet other staff needs (who aren't front-line) and also to meet unique branch needs. Regina: wants to provide a great summit for our librarians where they can take home concrete ideas and new plans. She is worried about the amoutn of time that will need to be invested to work on this project. Georgie: wants to contribute to a group of staff who are more administratively active (similar to Connie's concern); she wants to participate to help represent Ruth Enlow. Aliceana: wants to meet, brainstorm and create a great 2013 Summit; she wants to hear new ideas; she wants to get out of her cubicle to be more engaged with new friends in new spaces; and she wants to learn. Susie: is concerned about coming up with ideas; realized that she needs to provide more informative feedback when asked to complete evaluations because now she knows how evaluations are actually used to provide feedback! ; getting to be involved in a "major project." Julie: having an opportunity to create an alternative Summit experience; one goal is to work on making the process more engaging for the #makeithappen team; wants to improve on 2011; wants to get to know the team members better. Full and part-time staff from all four library systems (ACLS, RELIB, WCFL, and WMRL). To Do: By Feb. 11, 2013, Georgie, Aliceana, Chris, and Regina have been asked to get #s of Friends of Library members so we can know how many there are when considering total possible number of participants. What do we want participants to walk away with? To do: By Feb. 11, 2013 the following team members will contact these possible summit locations to gather information on availability, accommodations, pricing, food, etc. JZ will get the official wording from Joe Thompson but until then here's the answer I gave the team: A couple of years ago the WMRL advisory board was asked if they'd support the Regional hosting and facilitating a one-day staff day every other year and the board said yes. So, every other year, the Regional's staff development coordinator is responsible for putting a team together to #makeithappen. How will we keep Summit notes and progress accessible? We're going to use this blog with the tag Summit 2013 for every post. Should this format prove ineffective we can always change it. Exercise: The team reviewed the feedback received after the 2011 event and based upon that feedback, we generated ideas for how to overcome some of the weaknesses. If we require registration, announce the registration date and options a couple weeks in advance in order to give part-time staff a head's up. If we require registration, have folks sign up for the programs they want w/o limiting class size and then just find rooms to accommodate the amount of people. That way if there's a program no one is interested in, we just won't offer it. Need to improve upon the food - process in which it is served and enjoyed as well as the taste. Exercise: team came prepared with ideas for themes that would set the stage for the Summit and then we voted to identify our top 4 themes. To do: JZ is going to create a brief SurveyMonkey and ask staff across all four systems to vote on their favorite theme. Behind the scenes of these themes we're hoping to keep a taste of an unconference. Dave Treber from Conference and Event Services brought along two colleagues who work at the Lane University Center to share a little bit of information about FSU's facilities so we might consider them as a location for the Summit. Chris McGee is going to be having conversations with FSU in the future to gather more information and details so we can make a better decision on location by Feb. 11th. First impressions were that it's a very attractive location - all the space we'd need is under one roof, on one floor - besides dining which is on the 2nd floor; wifi and parking sounds hassle free, dining options are large and customizable - they recommended we look at CaterTrax - I'll share the URL when I have it. Possible speakers and programs: was tabled until after a theme has been chosen. 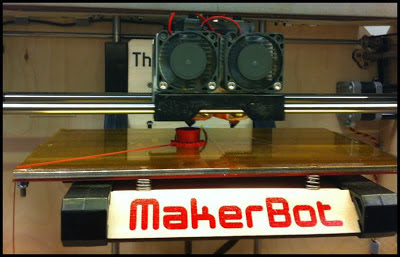 Maker Sapces: was not talked about too much. Chris did say that he and John Taube had talked about this and came to the conclusion that if this is something that ends up fitting the theme of the day that we should focus on a program that teaches how to use your meeting room as a maker space. Transportation: In 2011 and also 2009, the Summit team was not responsible for organizing transportation for the counties' staff however, depending on how the finances play out, we are considering at least getting pricing for charter buses. Our thinking is that if we provide a comfortable mode of transportation folks won't mind traveling as much should we want to hold the event in either Garrett or Washington counties. JZ will find a location for the meeting and let you know ASAP. 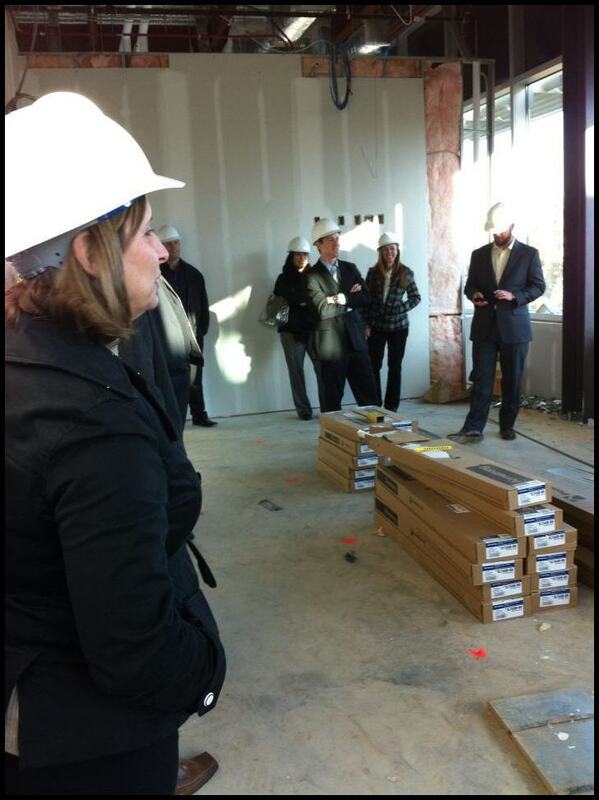 On Friday, Dec. 14th I attended Leadership Washington County's local government day. 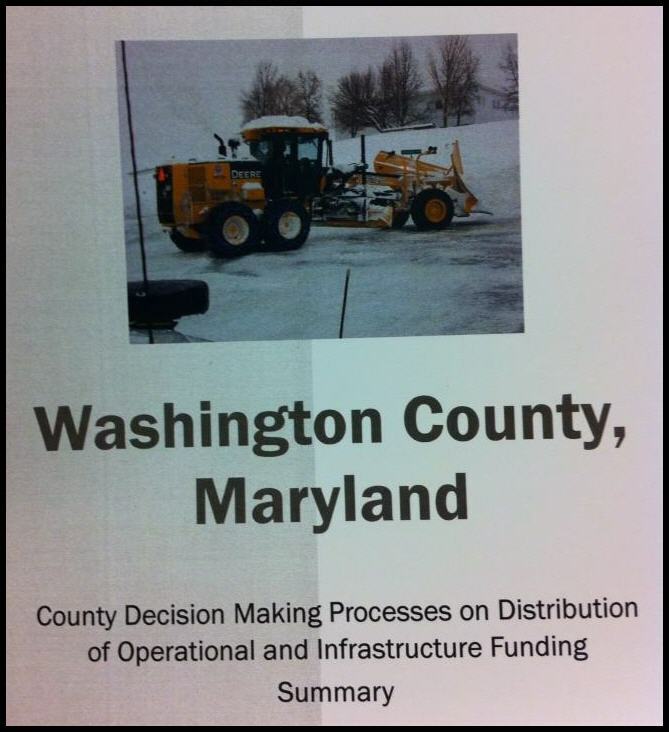 Thesis of the day: How does the city and county make decisions to disperse funds to operations and infrastructure that fulfill the strategic plans of our local government? The first half of our day was spent at City Hall listening to a series of presentations given by City Administrator: Bruce Zimmerman; Mayor David Gysberts; Dave Hanlin, Development Coordinator for Washington County Free Library; and Evvie Williams with the Washington County League of Women Voters. How are the city and county governments utilizing social media to engage the citizens into having hearty discussions and sharing of ideas in an online environment? Why do we need to bring jobs to the citizens? Why can't we teach citizens how to become successful entrepreneurs through the use of their own creativity, skills, and freely accessible technology (hello, library)? Why can't Hagerstown try creating and utilizing a complimentary currency program to help revitalize downtown? Bernard Lietaer has done some wonderful things with complimentary currencies and down-trodden economies. Why not here? 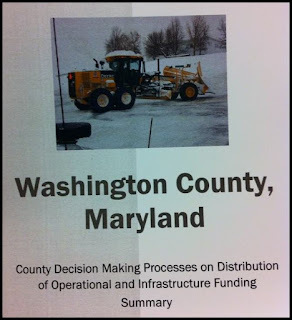 The second half of the day started at the Washington County Government building hearing all about how to county government is structured, how financial decisions are made, etc. Then we heard from Commissioner Ruth Anne Callaham who talked about her role as commissioner and the role of the commissioners as a whole in the county. Then we got to tour the still-under-construction Potomac Street library which is partially funded by the state, city, and county. This book is available from WMRL. How to facilitate an unconference that is productive, fun, and educational. There were several take-aways that I'll highlight. The first being that if you don't already have the book, Library Camps and Unconferences, you need to buy it. Right now. Sam says it is worth its weight in gold and has been the most valuable piece of staff development literature he has read to date. He planned and facilitated his first ever unconference simply by following the advice in this book. The second take-away is in order to have a productive unconference the theme should be something that's flexible yet long-standing. For example, customer service has many facets and has not yet yielded any quick and easy results. Therefore, a topic such as this would lend itself well to an unconference because it would ideally generate lots of discussion. One topic that would not lend itself well to an unconference format would be, "how to teach patrons Microsoft Excel." The third take-away is that in order to be successful, an unconference doesn't need to result in deliverables. The discussion and ideas and connections made during the process of the unconference is success in and of itself. Although, should deliverables happen, then they happen. I actually had an ulterior motive for coming to this unconference. I had recently been volunteered to investigate how MD libraries could make use of video streaming technology such as UStream and since I did not have any experience with UStream I thought the unconference would be an appropriate venue for picking the brains of other folks who may or may not be involved in this project. And I was right. It was extremely valuable. Working with Shayna Siegel, Sam Eddington, Helen Blumburg, and Kim Smithson, the group of us walked out of there with 3 events that we're going to attempt to stream live to UStream. Start small. Your first unconference shouldn't be a group of 200+. How about 20 or 25 instead? You can apply the unconference flavor to all sorts of events: un-meetings; un-performance reviews, etc. Be creative! The space for your unconference should be very flexible - able to move chairs that are lightweight; lots of white boards and markers; etc. So what am I going to do with my new-found knowledge? Well, besides tackling the UStream project with more enthusiasm, I will share what I've learned about unconferences with the Tri-County Summit 2013 #makeithappen Team. Perhaps a portion of the Summit could be unconferencey; maybe an un-breakout session? How would you like to see unconferences comes to the region? What was particularly impactful from Hugh Byrne's talk on mindfulness and meditation? The point is not to make an effort, but to be. - The notion of washing a dish mindfully, not washing the dishes mindfully. If you are thinking about what you are doing, you are thinking about the one dish you are currently working on, not the sink full of dishes that await you. - The image of reactions being like wild horses carrying one away in a great rush. When the rush is over, there is nothing to do but walk quietly home, apologizing to all injured by the wild ride. The start of the ride is exhilarating briefly, but only briefly and then the impact and regrets and justifications begin. In this case it is definitely preferable to get off the horse, or not get on it in the first place. Now, how does these insights affect who am I and how I behave to others at work? I attended Mindful Customer Service training with Hugh Bryne, Ph.D. on 12/6/12. He taught us basic mindfulness practices including how to focus our awareness (try to listen to your breath...not the clock), to be aware of thoughts/thinking (try to quiet that innervoice and focus on the breath), and how to work with difficult physical/mental experiences (which I could use a refresher on this practice). I would enjoy a full day session where we could focus on mindfulness to inter-personal relationships. I liked being able to meditate while being at "work" but being on the floor would have been nicer. I'm greatful that Michelle asked about getting distracted while meditating and Hugh said that was ok as long as we acknowledge that we are aware that our focus is on the thoughts and we can choose to focus on the thoughts or redirect to focusing on the breath again. This was really helpful to remember/know that I was not the only one being distracted by my inner voice. Hugh also said this distraction is great practice in training our brain to behaving in new ways. Ouch, I already forgot my mindfulness training while helping a mother who was helping her child. Who is writing this report on Indians anyway? Sign me up for session two on interpersonal interactions. Meditating in that venue was interesting, though relaxing and releasing thoughts was made effortless under Hugh Byrne's calm guidance. I intend to follow up listening to some of the podcasts. On Thursday, Dec. 6th, Hugh Byrne, Ph.D. presented a four-hour workshop on mindfulness and disappointingly not directly on customer service but connections could definitely be made. Plus, it opens up the possibility of having a "part two" workshop in the future in which the focus would be directly on applying mindfulness to our interactions with colleagues, friends, library patrons, family, our neighbors in the check-out line, etc. The following post includes the most poignant takeaways that resonated strongest with me. Mindfulness is about producing an appropriate response. When we're mindful we're fully in the present moment. I interpret this as meaning when we're having an interaction with someone, let's say a library patron, we're experiencing that person as brand new and novel, and without the stories we tell ourselves about that person (i.e. "Oh, here comes that guy again. I bet he's going to say he didn't deserve his fines, again, like he always does..."). And without the stories we tell ourselves about ourselves (i.e. "I never know what to say to this guy. I won't be able to handle him." Instead, we great him and ourselves with kindness and presence and we take the interaction moment by moment. In other words, we produce an appropriate response - as opposed to a cookie-cutter type of response. If we bring positive, pleasant energy to a situation then we have a greater chance of eliciting the same kind of response from whomever we are interacting with. This got me wondering if our collective (human) weakness in mindfulness is why policies exist. I think maybe well-written policies exist in an attempt to capture the most cookie-cutter type response that is also on some level generally appropriate in most situations. It makes my head hurt trying to understand the sentence I just wrote but, there it is. The situations that don't fit into or go beyond the cookie-cutter response are good times to dip our toes into the water that is mindfulness. What would be left if I stopped doing ________ ? At one point during the workshop Dr. Bryne was talking about how unmindfulness (is that a word?) manifests itself by the things we do to excess: eat, watch tv, sleep, consume alcohol, gossip, etc. And he said something to the effect of if you're mindful, even for a moment when you're scarfing down a stack of those Lofthouse sugar cookies with the 1" of icing on them, ask yourself, "what would I be left with if I stopped eating these cookies?" Essentially we need to ask, what need is trying to be fulfilled - ineffectively - by eating cookies/watching tv/drinking/sleeping/smoking/gossiping, etc? Then we have something we can work with, something that can then become the focus of our mindfulness, even if it's just for a moment. If we can interrupt ourselves by asking that question when we're caught in those cycles of unconsciousness (I'm going to use that word instead of unmindfulness because at least it's a real word) then eventually we can break the cycle all together. But it takes time and energy and dedication and mindfulness. If you're interested in getting small doses of mindfulness during your day, I highly recommend the free podcasts from the Insight Meditation Community of Washington as well as those available from Hugh. They're both available in the iTunes store or from their respective websites. I've become slack with posting about the meetings I attend so, in an attempt to rectify my lazy ways here's what went down at the most recent MLA Technology Committee Meeting on November 29th. Any MLA members are welcome to join the Tech Committee. Just contact Stuart Ragland for more information. The Tech Committee would like to get the MLA office their own laptop, projector, and screen for use during meetings and presentations at the MLA office (and potentially at off site locations like the annual conference). Some team members, including myself, were asked to gather some more information about the options available to us so we can make more informed decisions when we get the green light to buy, buy, buy. There is a subcommittee of the statewide staff development coordinators that is headed by Joanne Trepp that has agreed to take on the task of coordinating online learning exchanges. The first event they are hoping to do is an online follow up to an LMD (leadershp and management division) event. Joanne wanted to check with Margaret to make sure it'd be OK for her subcommittee to hold an online learning exchanged fueled by the LMD event that is free. The concern here being that most MLA events charge a fee but Margaret said that due to past discussion and decisions made by the PDP (professional development panel) that MLA does not charge for discussion group events - regardless of whether they are held in an online or physical location). In the end, Margaret decided that she'll get back to Joanne and let her know that she indeed has MLA's blessing, zero charge and all. Stuart recommended considering live streaming parts of the conference in 2013 using such technology like Ustream. I let him know that there is going to be a Ustream test on Dec. 10th with some folks, including myself, from across the state. So, the committee agreed to wait and see what the Dec. 10th event finds and to go from there. The committee also selected preconferences and programs that at-first-read sound worthy of being recorded. Margaret is going to compile a list of the programs we selected so we can check for overlap in the schedule and finalize our first picks. MLA will need to get the presenters' consent for recording in advance so, the sooner we make our decisions the better. We also talked about the need to increase the amount of video cameras we have access to at the conference. Right now we have 3 which greatly limits our recording capabilities. If anyone reading this has a proper video camera and tripod that you wouldn't mind letting the Tech Committee borrow for three days in May, will you please let me know? Yes, there once was a photocopier subcommittee and they did a fantastic job of hooking the MLA office up with a brand spanking new super scanner/copier extraordinaire. Yay! More from MARAC - from a digital perspective. I also attended the MARAC (Mid Atlantic Regional Archives Conference) conference in Richmond, but did not attend any of the sessions that Elizabeth Howe reported on. The presentation by Edward Ayers, President of the University of Richmond. Ayers has taken vast quantities of historical data and made it accessible and understandable by mapping it. So for example on the Digital Scholarship Lab is Presidential Voting, which graphically shows how the country changed its allegiances over the years. Another map that I found impressive was one mapping slavery’s end during the American Civil War - Visualizing Emancipation. I can dream of making the information on Whilbr more visually attractive and meaningful. The session on social media in archives/ history collections provided some new insights. Several of the presenters talked about History Pin, which has come a long way since I looked at it a couple of years ago - History Pin It still has inaccuracies in my opinion (bridges on the Antietam Creek incorrectly identified etc. ) but is another way of presenting data graphically. Another presenter thought that Flickr was a useful way to present data in sequence. A piece of software that I need to check out is Tesseract - a free OCR package. Since I have a purchased program I have not had the need to look at it, but it might be useful for those who don't want to retype something that already exists in some other digital form. And the reminder that crowd sourcing is a possibility for transcriptions - see Australia National Library - Trove for example. We would appreciate getting help to transcribe documents writing in 19th century script to add to Whilbr. Any one want to help? On Wednesday, November 28th I attended a statewide Maker Meet-Up at the West County branch of the Anne Arundel County Public Library. There is actually a ton of information and resources available to you if you click on the Maker Meet-Up link. There is also a Flickr (online photo album) of the event. You can also read the news article about the event. With that said, I'll focus mostly on my personal take-aways and ideas I got relative to staff development in western Maryland. I attended the event wearing two hats: 1) my "I-wanna-be-a-maker" human hat and 2) my staff development coordinator hat. Basically, I needed to reconcile the fact that I personally know very little about the maker revolution with the fact that I need to be able to take bits and pieces of it back to my colleagues in the western MD region. It turned out to be the perfect event to do just that. So, how did I do this? Well, the event kicked off with a round of lightning talks (5 minute presentations that just introduced the different maker spaces that were available to us in the room) and through listening to them I was able to get a list of possible collaborators/presenters for future staff development events and it helped to wake up my creative brain so I started thinking of other people/organizations I could reach out to. Such as? Matthew Barinholtz with FutureMakers in Crownsville, MD. Gary Mauler with RobotFest in Linthicum, MD. Attn: Children's Librarians. The two guys listed about would make knockout kids' programs. After the lightning talks I got to feed the part of me that is Enneagram 7 by experiencing the maker spaces in the room. I immediately went to the RobotFest table and learned how to use the Scribbler program to make a robot do my bidding - bidding like playing a midi version of Beethoven's 9th Symphony, spinning around in a circle, and flashing its lights. I figure it's only a matter of time and money before I have my own Scribbler robot to do my important bidding like getting up at 6am and making me breakfast. I actually spent more than an hour playing with this robot and the software and it was so much fun. It took only a little explaining on Max's (RobotFest guru) part to get me started but after that, I was off and programming. A screenshot of the Scribbler program. After I grudgingly left the RobotFest table (other people wanted to play, too) I had to find time to eat lunch and then attend an affinity talk. I didn't know it when I signed up for the talk but it was with the RobotFest guy, Gary Mauler. He talked about, "So you want to hold a festival for tinkerers?" He spoke a little about things libraries should consider if they wanted to hold a maker space event - particularly one focused on electronics and robotics - and other alternatives there might be for them to encourage creativity and the maker spirit in the community such as checking out DIY Inventor Kits like the ones sold by Sparkfun Electronics. The one less-than-attractive quality of checking out these kits is that you'd have to inventory every single itty bitty part that's in them. Or, you could just invest in buying a stash of replacement parts which are actually pretty cheap. He also says that it would help if the library subscribes to magazines like Make, Nuts and Volts, and Servo. We ended the day with a keynote talk by Jeff Sturgis, founder of the Mt. Elliott Makerspace in Detroit, MI. Although the information and stories he shared were extremely captivating and energizing, they haven't yet sparked any ideas...more like a lot of best practices to keep in mind when trying to create a makerspace. Here's a hint: keep it simple, go slow, and don't do it alone. I know what you're thinking. So me the money. Right? As it turns out, DARPA offers grants for such projects (yes, DARPA) and Cognizant is offering similar funding opportunities. They have this crazy notion to help folks just like you create and launch 500 makerspaces in the country over the next 5 years. As you might imagine, they've been really active in the maker revolution. Just Google them and you'll find interesting articles. All you have to do is fill out the grant applications! Compile a list of staff in the three counties who have awesome maker skillz. You know who you are! WMRL could start their own makerspace collection (much like we started the emerging technology collection) for staff from the three counties to check out maker-type kits. What ideas do you have? How can we play more at work? What would you like to see happen as a result of this new and novel trend? 1. An Enduring Profession - Reconstructing for the Next Forty Years (Mid-Atlantic Regional Archives Conference, Fall, 2012, Richmond, Virginia). 2. October 25 and 26, 2012. 5. a. In the day-long workshop "Beyond the First Year: Practical Advice for New Lone Arrangers," we were given an outline that summed up the most important things for lone arrangers (also applicable for librarians) to focus on. These included: vision, mission, objectives, strategies, and action plans, publishing, volunteers, budgeting, understanding limitations/abilities, strengths/weaknesses, and being persistent. b. Not as practical, but thought provoking, was the concurrent session "Continual Reconstruction: Tracing Changes in the Archives Profession." I learned about changes in a major archival journal, a leading professional organization and in archival education. c. The concurrent session "Put Your Archives on the Map! Using ArchiveGrid to Promote Archival Collections" was most informative. ArchiveGrid was developed and is supported by OCLC Research, and is a tool that facilitates the discovery of primary source materials. In the past patrons had to pay a subscription fee to use it, but now it's going to be free. Right now there is a beta version that is usable while they change over. 6. Because this was an archives conference, what I learned is most applicable to archives, i.e., Western Maryland Room. 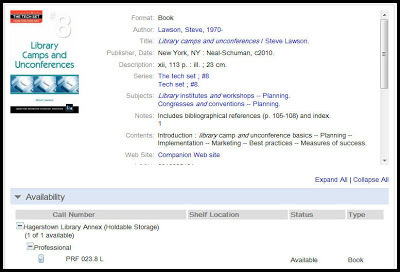 Our history library/archives can be improved by the information (free ArchiveGrid!) and pieces of advice mentioned above. I hope to help implement them. November 11, 2013 is WMRL's Tri-County Summit (aka staff day)! Ok, so you probably don’t have to mark your calendars yet. I do want to introduce you to the Summit 2013 #makeithappen Team. These folks will be working together over the next year to plan, organize, and execute our day-long tri-county staff day. Feel free to talk with them if you have questions, concerns, or suggestions for next year’s event. Take care and stay tuned for updates as the team makes wonderful and exciting progress! On Wednesday, November 14, 2012, I attended Rayna Schroeder's workshop Serving Your Customers Without Sacrificing Yourself at the LaVale Branch of the Allegany County Public Library System. I was really looking forward to this workshop, as I deal with difficult customers on a daily basis, and while I always try to be polite, professional, and helpful, it's usually at the expense of my nerves! I definitely got a lot out of this workshop. I'm not sure why it came as such a shock to me, but the biggest thing I took away was that different people have completely different sets of triggers than I do, and that we can use each others' strengths and weaknesses to our advantage. All of this also helped me recognize my own personal triggers, which is something I had never really given much thought to before. The workshop really gave me a lot to think about, and several self-improvement goals for me to work towards, which will help me stay calmer and more focused when serving library patrons. In turn, I think this will help improve all of our patrons' library-going experiences, as it will create a friendlier, more welcoming atmosphere; if I can deal with difficult patrons without getting upset and feeling overwhelmed, then not only might I have helped that particular patron, but I may have helped everyone in the library at that time to avoid a much more unpleasant experience. I attended Rayna Schroeder's workshop 'Serving Your Customers Without Sacrificing Yourself' at LaVale on November 14. This sounded like an interesting topic for me, as I deal with customers every day, and some of them can be challenges to my good nature. I learned that if I can identify my 'triggers', actions that will make me angry, I can learn how to diffuse the negative energy before I lose my cool. There are tools that can help me keep calm and they include the SOSS model. SOSS stands for Stop, Oxegenate, Strengthen Appreciation and Seek Information. The more I can emotionally understand a person, the less negative energy will be directed their way. I will try to encourage my coworkers to give our customers the benefit of the doubt and try to empathize with them and the library environment will be a nice place to be in! On Nov. 9th I participated in Leadership Washington County's Education Day. The following is a brief and probably incomplete description of that day and some thoughts and questions I had throughout. The thesis for the day was how does Washington County Public Schools prepare students for secondary education and skills development. To answer this question we visited 4 schools and heard from a variety of educators and administrators. Our first stop was to the Marshall Street School which provides special education to students ages 3-21 who are in challenging cognitive and physical situations. Every student has a highly specialized IEP (Individualized Education Program). Most class sizes are very small and have at least one teacher and one assistant (sometimes a nurse) present at all times, depending on the needs of the students in the class. I was blown away by the amount of energy and compassion that the teachers, administrators, staff are required to bring with them each and every day. Seeing this school and seeing how the classes were conducted and how the students were treated inevitably made me wonder: what if all students - not just those we label as having special needs - were given an IEP? What if all students got to take classes where the student:teacher ratio was 1:4? I know the immediate answer is most likely, "because it costs too much" but it's still something worth thinking about and I think it's something worth striving for, as well. One interesting tid-bit that I learned was that there is still quite a stigma attached to the idea of a Tech High School which causes parents to not encourage their kids to apply to the school because, "that's for kids who aren't college-bound..." As a result, the tech high faces recruitment challenges but they feel confident that word of mouth will help alleviate some of the stigma as time goes on - especially if those mouths are talking about how last year's biomedical class of 15 students were collectively awarded $1.6 million dollars in college scholarships (not including loans). Our afternoon was spent in Boonsboro at the Elementary School and the High School. Our first stop was into a gifted and talented classroom where the teacher told us all about how the G&T program works, how students are labeled at G&T and then what kind of exercises they do in class - creative thinking, analogy building, etc. I loved it; it was like a mental playground. At the high school we heard brief presentations from a variety of teachers and administrators. Mostly they talked about AP test prep, SAT/ACT prep, etc. The guidance counselor talked about % of students who apply to college, etc. Then we walked back to the Elementary School to hear a panel of three gentlemen: the assistant superintendent of schools, a representative from HCC, and a representative from Kaplan University. I didn't get too much out of this portion of the day so, unfortunately, I do not have anything to report. Some last thoughts/observations I had: I couldn't help but think of the poverty vs privilege debate from the Human Services Day back in October. For example, some folks might see the Marshall Street School students as disadvantaged but not me. They're receiving a huge benefit from the school; they've extremely privileged in terms of the education they're receiving. I'm not down-playing their life-situation but the Marshall Street School is an extremely admirable resource in the county. I also think of privilege in terms of intellectual privilege and the students who are accepted into programs at the Tech High. So, if the Marshall Street students and the Tech High students are the privileged ones, who are educationally impoverished? I guess I would say, in some instances, it's the students who fall in the middle, those who are not on either extreme of the bell curve. This could include students who do not flourish in a standard educational environment or students who aren't interested in attending college right after graduation. Does this mean we as a society place less importance or see less value in these individuals and members of our communities? On Nov. 12th, the Washington County Free Library had their annual staff day. This year's presenter was Sandy Lundahl, a certified teacher of the Enneagram in the Narrative Tradition. I've taken the Enneagram 3 times now and I've remained consistent in my top 3 types. I'm primarily a #7 - The Enthusiast. My 2nd strongest type is #5 - The Thinker. My 3rd strongest type is #9 - The Harmonizer. Those who know me well might recognize how my type combos come to benefit me in my current role as Staff Development Coordinator for the Regional. 7s like variety and we like to plan fun things. Well, working with three different counties' worth of awesome library staff plus serving on committees statewide provides me with tons of variety, and then I get to plan fun staff development workshops and the Tri-County Summit. However, as a 7 I have some challenges I need to recognize. For instance, I do get bored pretty easily which relates to some struggles I have with seeing a project through - especially if I'm working on it by myself. I find I do much better seeing a project from start to finish if I work with other people. 5s like to be self-sufficient and left alone which shines the spotlight on my introverted nature and my daily meditation practice. I also pride myself on being very self-sufficient - much to the chagrin of my #2 Mom who wants nothing more than to help me. So, that's a struggle for me - learning to let others in and let them help because it's all coming from a good place. 9s want to keep the peace and avoid conflict which I feel I do on a daily basis; I'm a very skilled in the art of compromise. I do not thrive on conflict and I want everyone to be happy (another 7 tie-in). I sometimes strongly empathize with other people to the point of being able to physically feel their emotions which can be great for customer service and relationship-building but I'm no good at delivering bad news or saying no. I once again attended Kids Are Customers Too. I was not as pleased with the event as I had been in prior years. Previously, the event consisted of breakaway sessions that allowed the participant to select sessions of particular interest. This year everyone was kept together. We had a session on a Cold Storytime. Next was a session on healthy snacking for teens/kids. This was an interesting concept. The County Extension Office worked with the library to teach the concept of healthy snacking and its preparation in conjunction with an event such as gaming. I would like to see something similar happen with teens at the Leonard P. Snyder Memorial Library. Kate Riggs, winner of the Blue Crab Award, spoke on editing. The remainder of our time was spent with reps from Baker and Taylor as they introduced us to upcoming releases, the majority of them YA books. Well it is about time I got around to blogging on this event. This was a fun day filled with children's storytelling activities such as Hip Hop Tooty Ta. There was a large portion that I was already familiar with as I have heard the presenters three times previously. However, I was pleased to see they added a section on storytelling for elementary age children. I also learned I need a ukelele, a parachute, and an updated music collection. The Association of Bookmobile & Outreach Services 2012 Conference was a great learning experience. Dr. Gary Fountain, Rector of Chatham Hall kicked off the conference with an inspirational speech of how he has integrated technology into the Chatham Hall curriculum and Library. Attendees also had the privilege to listen to author Donald Pollock read a few excerpts from his book The Devil all the Time. I personally don't care for murder mysteries, however Pollock has such a smooth voice I could listen to him read instructions on how to assemble a bookcase. The workshops covered a wide range of topics that our department provides. I chose to attend a few early literacy seminars, reaching seniors in assisted living and a marketing seminar. Hands down Flaunt Yourselves: Using Outreach as Marketing was worth the trip alone. Chaundra Carroccio & Tameka Roby from East Baton Rouge Parish Library explained what works and what doesn't for their department. This dynamic duo can energize a crowd and their charisma keeps their department running on all gears. One of the many highlights of the conference is being able to tour the numerous bookmobiles from other libraries. After touring the other bookmobiles I am thankful for our efficient layout and two laptops. If at all possible the next time the conference is held near Maryland our bookmobile should be displayed. Overall the conference was a great experience. The seminars and speakers offered some new ideas. I meet and talked with other outreach workers from both huge departments to as small as one man show. We discussed schedules, staff sizes, and number of vehicles per department. After speaking with my fellow comrades I felt confident that our department is doing a great job. Silent & Live Auctions Webinar by ejimpact. The webinar offered a variety of suggestions for making these events fun, exciting, and successful and offered a step by step process from the beginning stages of planning to the auction itself. Great powerpoint in my files for reference next time we employ this type of fundraiser. Some things from the workshop that I'd like to apply: Sorting/Patterning activities, Storytime sharing, and the Hip-Hop Tooty-ta :). I think in the future, I would like to add the sorting/patterning activities to my storytimes. My aha moment was realizing I will never play the ukelele :)! One storytime question: How can we double up storytellers for our programs in Washington county? The only suggestion I had was maybe make the musical instrument portion more general and not just ukelele specific. I enjoyed getting fresh book and song suggestions to incorporate into my programs. Well done girls! It was a big (BIG!) year for ABOS. We elected new leadership, redesigned our logo, and completely revamped our website. This year's conference brought the most bookmobiles ever in conference history (12!) and a huge number of conference attendees from all over the United States, from rural Washington state to urban Baton Rouge, Lousiana to good ol' Baltimore city here in Maryland. The conference committee did an excellent job in organizing the venue; the Richmond Marriott staff were pleasant, the atmosphere was energetic and full of fun, and the events (from the sessions to the author lunch to the ghost tour) were all a big success! The most important thing to know about this conference is that it is not just for bookmobilers. ABOS is an organization that supports all kinds of outreach services provided by libraries and librarians, not just mobile library service. And I've yet to meet a librarian who has never performed any outreach, because it is what we do! The overwhelming majority of attendees and presenters do work in mobile outreach, not just driving bookmobiles, but delivering books to homebound patrons, sending books by mail, running rural delivery services, managing a mini-branch located within another organization/business, or conducting programming to the communities we serve. This conference brings all of these ideas and programs together in one place so that we can learn from each other and share our experiences, both successes and failures, and support one another through change and growth. 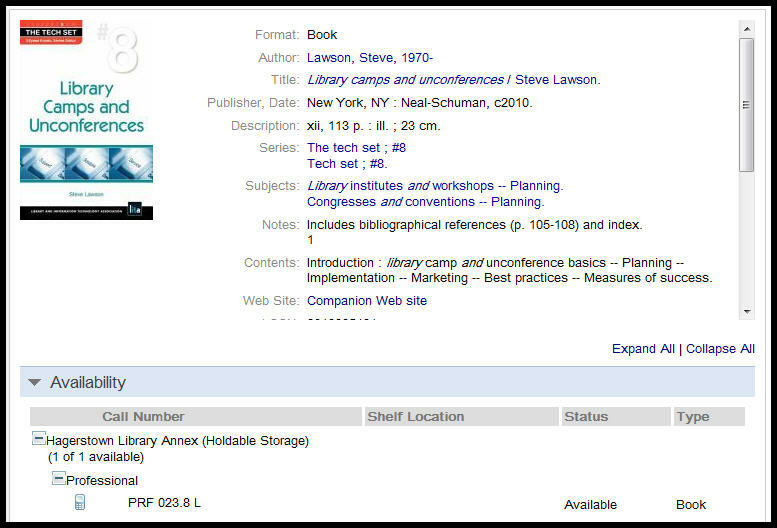 This is how libraries are able to evolve. Overall, there is truly something for every librarian at this conference. And the setting is intimate enough that I felt like I came away from a summer camp sort of experience having met people that will truly influence the way that I work and the way that I manage my department for years to come. In spending time with those people who do what I do every day, I find that I am amazed at the work that we do and the dedication of those who do it. It is invigorating to be a part of a group like ABOS that is so committed to library engagement by whatever means necessary. It is also humbling and inspiring to see how other libraries are working without the same support that we sometimes take for granted here in Maryland. I feel lucky to be a part of the WCFL Bookmobile team and to be able to share in the history that has made us a great service in Washington County. If you are interested in outreach or what exactly ABOS is, check out their website at http://www.abos-outreach.org or feel free to email me and I can help you to get more involved. Maybe next year, more of us will be able to represent Maryland libraries in Louisiana because we have a lot here to be proud of. Amanda and Tess did a great job! Parachute 101 was helpful, I needed new ideas. Tess's Ukulele presentation was cool and thought provoking. I'm always in the market for new song ideas. I like the Story time Theme Boxes, I have boxes but they are Seasonal. I think this has given me something to think about for my own Story times. I can always freshen up my programs. I think an extra break would be nice during their presentation. I really enjoyed the Storytime Extravaganza. It was very infomative, the program moved along quickly, and it kept everyone in attendance very involved. Easy salsa salad you can make in the library. Incorporating nutrition tips into storytime. Singing songs to time hand washing. What new releases are coming from Baker & Taylor? Heavy on the YA. Books in Motion by Julie D-G looks to be a must have for anyone doing storytimes. Everything she presented was imaginative. I can see using it all. Lots of singing and swinging. New books, new props, new ideas. Two presenters are better than one. How to use a parachute. How to plan a storytime on theme. New ideas for "old " stories. I really enjoyed the extravaganza, especially learning new songs, books, and storytime themes to use. While the storytime crowd at my branch is considerably smaller, I will be able to down-size the activities. I was glad to have the opportunity during lunch to discuss suggestions on how to get more participation. I have brought my hammer dulcimer to storytime, but a ukulele I could keep at the library would be awesome. I liked getting up and moving, but would have preferred fewer “jumping” songs. I liked the planning documents that were shared, along with the process of developing their storytimes. I hope I will have an opportunity to use them! On October 18, 2012, I attended the Kids Are Customers Too workshop in Westminster. This annual workshop is sponsored by the Children's Services Division of the Maryland Library Association. It is always interesting to go to workshops like this, where you get to meet librarians from around the state. Everyone always has such good ideas. This year, I learned that it is possible to have programs in the library revolving around healthy eating that involve children and teens helping to prepare food. We've had snacks before, but I wouldn't have thought to have kids help. I don't know if I'm brave enough to try it, but maybe! I also learned that it is much easier than I might think to get children up, moving, and interacting with books during storytime. Julie Dietzel-Glair's part of the presentation was by far and away the best- she could have talked all day! I definitely want to buy her book when it finally comes out. I was so amazed at how simple some of the ideas were, such as just getting kids to act out the words tall and small in a book. Storytimes are such an important part of my job, and I often feel like I'm running out of new and creative ideas. Yesterday certainly gave me a lot to think about! From June 13-19th, I attended a conference sponsored by Shenandoah University in Winchester Virginia entitled "Books Boys Can't Resist". Featured authors at the conference included Avi, Dan Yaccarino, Brian Floca, Ralph Fletcher, Charles Smith Jr., Melinda Long, Marc Nobleman, Danny Brassells, and others. The week long conference/course consisted of presentations by all of the authors, break out sessions about reading topics for boys, and those of us who took the course for credit attended afternoon sessions on literature strategies for getting boys interested in books. Danny Brassells discussed strategies for getting boys interested in reading. Ralph Fletcher talked about boys' writing groups and how to get boys excited about writing and sharing their work. Marc Nobleman's topic was superheroes- specifically Batman and Superman. Charles Smith Jr. writes sports poetry and talked about getting kids to use active verbs in their writing. Brian Floca discussed his art--specifically his book, "Moonshot" and the research he did for the project. The other authors discussed their works in depth and provided us with a background behind the how and whys of thier art. Many still had sketchbooks they kept as children and were able to show how they subsequently developed into the writer/illustrators they became. The course required us to maintain a journal that was turned in at the end of the week and, in my case, to submit a paper about a children's author. I wrote about Maurice Sendak and the elements that influenced his art. I was surprised that both the Holocaust, German Romantic Painting, comics, and Disney were woven into his books. Generally I felt that it was an excellent conference, giving me insight into to the work of many authors that we have in our collection. It also allowed me to meet other people who are interested in Children's literature, and to explore in depth a topic about children's literature that interested me. I loved the music, even though I have used some of it there was plenty of new. I also liked using a simple piece of yarn as a worm. Something that simple is really a creative idea. I always enjoy the sharing of books that others use during their story times. Fresh ideas are always nice and I will incorporate some of them into my programs. As for my a-ha moment, I keep going back to that piece of yarn that turned into a worm. Kind of sad isn't it? But I just can't believe that something that easy was so cute, and I didn't think of it on my own. My favorite part of the program was the sharing of music. I am always looking for new material and most of this was really neat. Especially the ways they jazzed it up like with the boots song. The only suggestion I would have is to not include material that is out of print. It is disappointing to see a book that you would love to have a copy of and then can't get it. You can tell Amanda and Tess work well together they really do a good job.